For other uses, see Bill Black (disambiguation). William Patton "Bill" Black, Jr. (September 17, 1926 – October 21, 1965) was an American musician and bandleader who is noted as one of the pioneers of rock and roll music. Black was the bassist in Elvis Presley's early trio after which he formed Bill Black's Combo. Black was born in Memphis, Tennessee, to a motorman for the Memphis Street Railway. He was the oldest of nine children. His father played popular songs on the banjo and fiddle to entertain the family. Black learned to play music at the age of 14 on an instrument made by his father—a cigar box with a board nailed to it and strings attached. At the age of sixteen, Black was performing "honky-tonk" music on acoustic guitar in local bars. During World War II, Black was stationed with the U.S. Army at Fort Lee in Virginia. While in the Army, he met Evelyn, who played guitar as the member of a musical family. They married in 1946 and returned to Memphis. Black worked at the Firestone plant. He began playing the upright bass fiddle, modeling his "slap bass" technique after one of his idols, Fred Maddox of Maddox Brothers and Rose. Black also developed a "stage clown" persona in the same way that Maddox entertained audiences. Black performed as an exaggerated hillbilly with blacked-out teeth, straw hat and overalls. According to his son, Black said his goal was always to give his audience "a few moments of entertainment and maybe a little bit of humor that'll tickle 'em for a while." In 1952, Black began playing club and radio shows with guitarist Scotty Moore. Along with two other guitarists and a fiddler, they performed country music tunes by Hank Williams and Red Foley in Doug Poindexter's band, the Starlight Wranglers. Black and Moore also played in a band with Paul Burlison, Johnny Burnette, Dorsey Burnette on steel guitar, and a drummer. In July 1954, Sam Phillips of Sun Records asked Black and Moore to play back-up for the as-yet-unknown Elvis Presley. Black played slap bass with guitarist Scotty Moore, while Elvis Presley played rhythm guitar and sang lead. Neither musician was overly impressed with Presley, but they agreed a studio session would be useful to explore his potential. On July 5, 1954, the trio met at Sun studios to rehearse and record a handful of songs. According to Moore, the first song they recorded was "I Love You Because", but after a few country music songs that weren't impressive they decided to take a break. During the break, Presley began "acting the fool" with Arthur Crudup's "That's All Right (Mama)," a blues song. When the other two musicians joined in, Phillips taped the song. The upbeat sound was original. Black remarked, "Damn. Get that on the radio and they'll run us out of town." The next day, the group recorded four more songs, including bluegrass musician Bill Monroe's "Blue Moon of Kentucky," which he had written and recorded as a slow waltz. Sources credit Bill Black with initiating the song, with Presley and Moore joining in. Moore said, "Bill is the one who came up with "Blue Moon of Kentucky." ... We're taking a little break and he starts beating on the bass and singing "Blue Moon of Kentucky," mocking Bill Monroe, singing the high falsetto voice. Elvis joins in with him, starts playing and singing along with him ..." They ended up with a fast version of the song in 4/4 time. After an early take, Phillips can be heard on tape saying: "Fine, man. Hell, that's different—that's a pop song now, just about." Phillips took several acetates of the session to DJ Dewey Phillips (no relation) of Memphis radio station WHBQ's Red, Hot And Blue show. From August 18 through December 8, "Blue Moon of Kentucky" was consistently higher on the charts, and then both sides began to chart across the South. Black and Moore became Presley's back-up group, earning 25% of his takings. Moore and Black left the Starlight Wranglers after the success of "That's All Right", jealousy within the group forcing them to split. 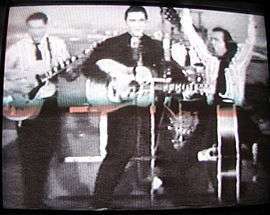 Their recordings at Sun were released with the credits as "Elvis Presley, Scotty and Bill". The group was later billed as "Elvis Presley and the Blue Moon Boys". Over the next 15 months, the trio released five singles, toured across the South, and appeared regularly on the Louisiana Hayride. They had originally auditioned for the Opry in October 1954, but they failed to impress the people in charge, or the audience, and were not invited back. In 1955, Black went to RCA along with Presley and Moore when Presley's contract was sold to that company. Except for the RCA reissue of "Mystery Train" and "I Forgot to Remember to Forget" ('with Scotty and Bill'), they were no longer credited on record labels. Black played on early Presley recordings including "Good Rockin' Tonight", "Heartbreak Hotel", "Baby Let's Play House", "Mystery Train", "That's All Right", and "Hound Dog", and eventually became one of the first bass players to use the Fender Precision Bass (bass guitar) in popular music, on "Jailhouse Rock" in the late 1950s. Black, Moore and drummer D. J. Fontana toured extensively during Presley's early career. Black continued his on-stage "clown" persona and developed comedy routines with Presley. Black's on-stage personality was a sharp contrast to the introverted stage presence of Moore. The balance fit the group's performances. According to Black's son Louis, Moore said, "Elvis used to just stand up there and not move, and Bill would jump around on the bass. Your daddy would come down through there and get everybody to laughing and loosen them up." Fontana called Black the mainstay of the band in the early days. "He was a comedian who could warm up a crowd. That was necessary for us because we played for a lot of country crowds that weren't used to people jumping up and down on stage." In 1959 Black joined a group of musicians which became Bill Black's Combo. The lineup was Black (bass), Joe Lewis Hall (piano), Reggie Young (guitar), Martin Willis (saxophone), and Jerry Arnold (drums). There were several personnel changes. While Young was in the army, his position was filled by Hank Hankins, Chips Moman and Tommy Cogbill. Ace Cannon replaced Willis on sax. Carl McVoy replaced Hall in the studio, while Bobby Emmons replaced him on tour. The band released blues instrumental "Smokie" for Hi Records in December 1959. "Smokie, Part 2" became a No. 17 U.S. pop hit, and made number one on the "black" music charts. It sold over one million copies, and was awarded a gold disc by the RIAA. A follow-up release, "White Silver Sands" (Hi 2021), was a Top 10 hit (#9) and, like its predecessor, topped the R&B charts for four weeks. Eight of the recordings by Bill Black's Combo placed in the Top 40 between 1959 and 1962. Advertised as "Terrific for Dancing" their Saxy Jazz spent a record whole year in the top 100. The Combo appeared in the 1961 film Teenage Millionaire and on The Ed Sullivan Show, where they performed a medley of "Don't Be Cruel," "Cherry Pink," and "Hearts of Stone", and were voted Billboard's number one instrumental group of 1961. Albums with themes included Bill Black's Combo Plays Tunes by Chuck Berry, Bill Black's Combo Goes Big Band, Bill Black's Combo Goes West, and Bill Black's Combo Plays the Blues. The Combo's sound of danceable blues became a popular accompaniment for striptease dancers. Another unique characteristics of the Combo was Reggie Young thwacking on the guitar with a pencil. In 1962, Bill Black opened a recording studio called "Lyn Lou Studio" (named for his son and daughter) on Chelsea Street in Memphis, Tennessee, with Larry Rogers (Studio 19, Nashville) as his engineer and producer. Johnny Black, Bill's brother and also upright bass player, who knew Elvis at Lauderdale Courts before Bill, recalls visiting Bill at the studio and reported that Bill would be totally absorbed mixing and playing back tracks. Bob Tucker and Larry Rogers purchased Lyn Lou Studios after Bill Black's death in 1965. The studio recorded many Bill Black Combo albums (with billings such as "The Best Honky Tonk Band in America" and "The band who opened for the Beatles"), and produced number-one country hits for Charly McClain, T.G. Shepard, Billy Swan and others. The house band for these sessions was the Shylo Band, featuring guitarist/songwriter Ronnie Scaife, nephew of Cecil Scaife, famed Sun Studio engineer. Early in 1963, Black sent from two to five different versions of the Combo to different regions of the country at the same time, while staying off the road himself, wanting to concentrate on his business, family and his health. In 1963, Bob Tucker joined the Bill Black Combo as a road manager and guitar/bass player. Black himself had been ill for the past year and a half and unable to travel. Nonetheless, he insisted that the band continue without him. The Bill Black Combo created musical history in 1964 when they became the opening act for the Beatles (at their request) on their historic 13-city tour of America after their appearance on The Ed Sullivan Show. Black himself was not well enough to make the tour. After two surgeries and lengthy hospital stays, Black died of a brain tumor on October 21, 1965, at age 39. His death occurred during his third operation that doctors had hoped would eradicate the tumor permanently. Black was buried at Forest Hill Cemetery in Memphis, Tennessee. Presley was criticized for not attending the funeral, but he believed that his presence would turn it into a media frenzy. He decided instead to visit the family privately after the service to express his condolences. According to Louis Black, Presley said, "If there's anything that y'all need, you just let me know and it's yours." Black's widow sold Bob Tucker and Larry Rogers both the right to use the name Bill Black's Combo. The band changed to country when it joined Columbia Records, and won Billboard's Country Instrumental Group of the Year award in 1976. Bill Black's Combo cut more than 20 albums, toured the United States and Europe and won awards as the best instrumental group in America in 1966 and 1967. Bob Tucker worked for the University of Memphis as Professor of Music Business as well as being leader of the Best Honky Tonk Band in America. Black's main stand-up bass is today owned by ex-Beatle Paul McCartney, who received the instrument as a birthday present from his wife Linda in the late 1970s. The bass can be seen in the video clip to McCartney's song "Baby's Request". In the documentary film In the World Tonight, McCartney can be seen playing the bass and singing his version of "Heartbreak Hotel". In 1995, he played it on "Real Love", the last "new" Beatles record (one of two in which McCartney, George Harrison and Ringo Starr overdubbed a full arrangement onto a John Lennon home recording from the late 1970s). Actor Elliott Street portrayed Black in the TV movie Elvis starring Kurt Russell. Actor Blake Gibbons portrayed Black in the short-lived 1990 TV series Elvis starring Michael St. Gerard. In 2005, Clay Steakley portrayed Black in the Elvis Presley biopic miniseries Elvis. On April 4, 2009, Bill Black was inducted into the Rock and Roll Hall of Fame. 1967 "Bill Black's Beat Goes On"
1962 "Twistin' 'White Silver Sands'"
1963 "Do It – Rat Now"
↑ Archived December 18, 2008, at the Wayback Machine. 1 2 3 4 5 6 7 8 9 10 11 12 13 14 15 16 Burke, Ken; Griffin, Dan (2006). The Blue Moon Boys: The Story of Elvis Presley's Band. Chicago Review Press. pp. 20–31. ISBN 1-55652-614-8. ↑ Morrison, Craig (1996). Go Cat Go! : Rockabilly Music and Its Makers. University of Illinois Press. p. 40. ISBN 0-252-02207-6. ↑ "Official legal title of Crudup's (and Elvis's) "That's All Right"". Repertoire.bmi.com. Retrieved 2015-08-18. ↑ "Sam Phillips' Sun Records". History-of-rock.com. Retrieved 2015-08-17. ↑ Hopkins, Jerry (1972). Elvis: A Biography. Macmillan. p. 52. ISBN 978-0-333-13617-1. ↑ Guralnick, Peter (1992). The Complete 50's Masters (CD booklet notes). ↑ Naylor and Halliday, p. 42. ↑ "Elvis Presley's Sun Recordings : SUN Stiudios, Memphis Tennessee : Elvis Articles : : 'For Elvis Fans Only' Official Elvis Presley Fan Club". Elvis.com.au. Retrieved 2015-08-17. 1 2 "Joe Cuoghi". Rockabilly.nl. Archived from the original on June 9, 2011. Retrieved 2011-07-03. ↑ Murrells, Joseph (1978). The Book of Golden Discs (2nd ed.). London: Barrie and Jenkins Ltd. p. 111. ISBN 0-214-20512-6. ↑ "Billboard - Google Books". Books.google.com. 1960-05-09. p. 41. Retrieved 2015-08-17. ↑ "Billboard - Google Books". Books.google.com. 1962-05-19. p. 22. Retrieved 2015-08-17. ↑ "Teenage Millionaire (1961)". IMDb.com. Retrieved 2015-08-18. ↑ Dave Dermon III, MCSE ddiii at dermon.com (June 9, 2008). "The Beatles on Tour". Dermon.com. Archived from the original on July 9, 2011. Retrieved 2011-07-03. "Bill Black". Rock and Roll Hall of Fame.